The script installer can be found here. The rsx plugin for easier file export is here. To import a mesh click the "..." button to choose a file then click the Load Mesh button to import it. A new animation track/clip will be created named "initial" with a single key at frame -10. This is the base pose of the skeletal mesh and is used instead of the default pose in trueSpace. In some meshes one or 2 vertices will not be skinned properly. This can be fixed by using the heal skin weights tool with settings shown above. The process is the same for Load Animation except that you choose an actor mesh in the scene before clicking the button. A new track/clip is created named after the md5anim file name. The first frame of the animation, frame -1, will be the base pose. The actual animation starts on the next frame. The md5anim file skeletal structure must match the structure of the mesh's skeleton. The useContentPath check is for saving the files to a predefined directory structure within the doom3 folder. 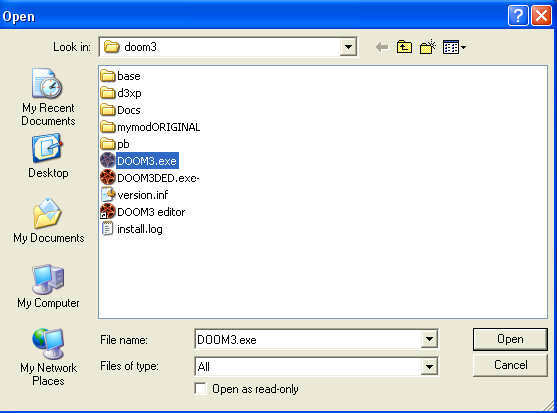 The doom3 folder, doom3ExePath, is set by using the "..." button and choosing any file at the root of the doom3 directory. Doom3.exe is a good choice. If it is not checked then file location for mesh and animation will be determined by a file dialog. 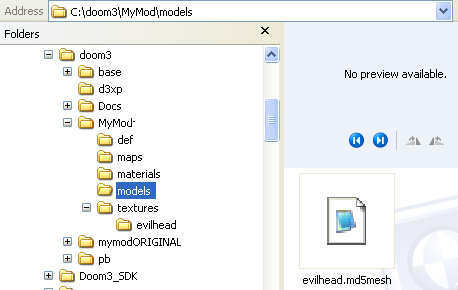 The modname will be a folder created in the doom3 folder and will be the base for the creation of file folders for models, materials, definition and texture files. texturePath is the path under modname that will be used when useContentPath is active. If blank this value will default to "texture/modelname" when saving a mesh file, where modelname is the name of the md5mesh file. The values shown in the image to the left will result in textures saved to "D:\doom3\MyMod\texture\modelname\". A doom3 compatible material can be downloaded from here. If Copy Textures is active the textures used in the diffuse, model and normal will be exported as targa(TGA) image files. The files will overwrite the previous versions with the same name. materialPath is the path under modname that will be used when useContentPath is active. If blank this value will default to "materials" when saving a mesh file. The values shown in the image to the left will result a material file saved to "D:\doom3\MyMod\materials\modelname.mtr". The name of the material in the file will come from the name of the material node in trueSpace. Materials can be named as if they were a full path by using "%" in the trueSpace material name. 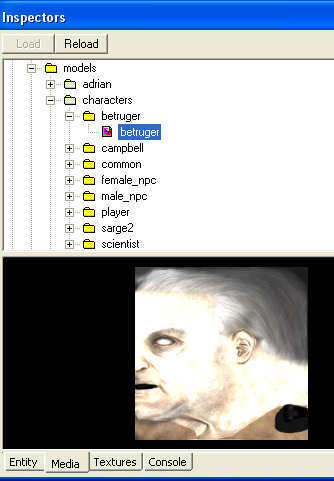 "models%characters%betruger%betruger" will be written to the material file with the name "models/characters/betruger/betruger" and will appear in a hierarchy in the doom3 editor. 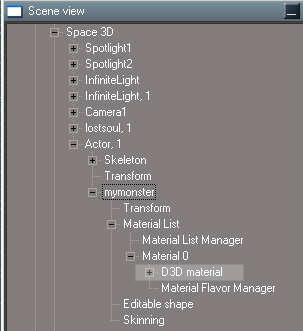 If the trueSpace material is not renamed the material will be named "D3D material". If Write Materials is active the material file will be created. This will overwrite any existing material files with the same name. defPath is the path under modname that will be used if useContentPath is active. If blank this value will default to "def" when saving a mesh file. Basic mesh and animation references will be written to the def file. If Write Def is active the definition file will be created overwriting any previous def files of the same name. modelPath is where the mesh and animation files are saved when useContentPath is active. The new skeleton button will create a compatible skeleton that can be used as a starting point. Start building from the top joint. The clear ik nodes button is needed to clear out any ik handles or stops. The export script will not work with these items in the skeleton. Save initial.md5anim will save an animation file when the mesh file is saved. The animation is just the pose of the actor at frame -10. It will also write a reference in the def file if Write Def is active. Save Animation Clips will save an md5anim file for each clip in the story view. The Save Animation text field is ignored and the files are saved to the modelpath if useContentPath is active or to the path of the md5mesh file indicated in the Save Mesh text field if it is not active. The start and end times of the clips will be used. If this option is not active a single file is saved and the animation start and end will come from the animation preferences play range. The Save Mesh button will save a mesh file and extra files if the options are selected in the UI. If useContentPath is active folders will be created for the model, textures, material and def files. In this case only use the simple name of the model, modelname ,not modelname.md5mesh. If these options are enabled then texture files, material and def files can be created along with placing the md5mesh in the model folder. If useContentPath is not enabled then a save file dialog will display and any extra files will be saved to the same folder as the md5mesh file. The Save Animation will save md5anim files. The first frame of the animation will not save as animation but as a base pose upon which the animation will build, so it might be a good idea to copy the first frame back one frame to act as a base. If useContentPath is active the animation will save to the modelpath and simple file name with no extension will be used. If save Animation Clips is also active the text of the Save Animation field will be ignored and individual files will be saved based on the clip names into the modelpath. If both useContentPath and Save Animation Clips are inactive then a file dialog will indicate the file name and location. If useContentPath is inactive but Save Animation Clips is active the clips will be saved to the same path as the Mesh Export text field. Clear UI - reset to "factory defaults"
BVH files can be used following this procedure. Load the bvh file into truespace. Push the new skeleton button to create a new compatible skeleton base. Use the link editor go inside the bvh skeleton and encapsulate all the joints and bones starting at hipbone. Also include the AnimClip node. Don't include the hip which has the Root transform input. Copy the resulting node into the doom3 skeleton. Connect the hipbone to "Joint". Rename "Joint" to "hip" to match the node left behind during the encapsulation step. Unencapsulate the group and export the AnimClip Nodes, AnimTrack connector. At this point it looks good but the full motion of the skeleton needs to be transferred to the origin/hip joint. Go to the utilities tab and push the Get Animation Clips button to populate the drop down list. 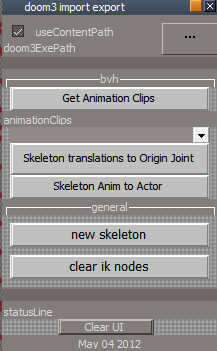 Choose a clip or the animation play range from the animationClips list and press the Skeleton translations to Origin Joint button. Now the full skeleton translation values have been placed on the origin joint. After the skeleton has been applied to an actor press the Skeleton Anim to Actor button to transfer the animations from the skeleton into the Actor. This last step is needed because the bvh skeleton contains the animation but characters animated inside truespace have the animation at the actor level. Now with that last process complete the BVH animations are compatible with the exporter. Once the content folders are reated and the asset files have been saved a new shortcut for doom3 can be created. Copy the doom3 shortcut and rename it "doom3 editor". Right click and change target to "C:\Doom3\Doom3.exe +set r_fullscreen 0 +editor +set fs_game MyMod". This sets the doom3 to run in a window instead of full screen, startup in the editor and set it to use the MyMod folder. If using windows7 and it comes up white disable desktop composition in the compatibility tab of the shortcut also add "+set r_multisamples 0 +set r_brightness 1.0" to the target. One of the animations in the def file should be called "idle" and it must refer to an existing md5anim file or the mesh will show in the editor as a box. If there is no "idle" animation use the entity tab to select another animation to get the mesh to show properly in the editor.